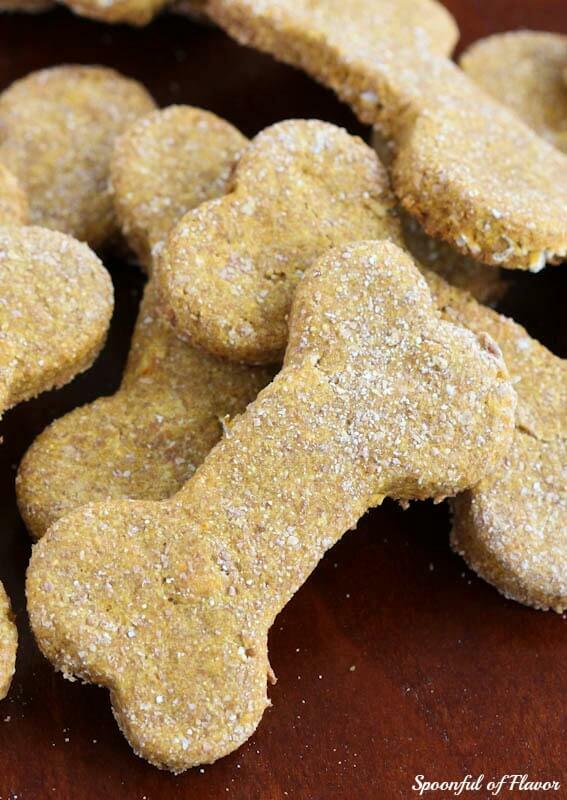 Peanut Butter Pumpkin Dog Treats are homemade treats made with only five natural ingredients! 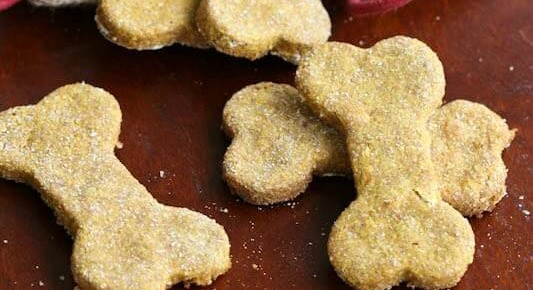 Everyone, including animals, need homemade treats for the holidays. With a few ingredients, one bowl and some cookie cutters these treats came together quickly and easily. I usually make three batches in one afternoon and package them up in little time. So don’t forget your furry friends this holiday season. Give them something wholesome and homemade.I don’t have a dog, but I give them as gifts to friends and family with dogs. I use cute little burlap treat bags to package them. No preservatives or additives. Just five pure and wholesome ingredients to make your pup happy. 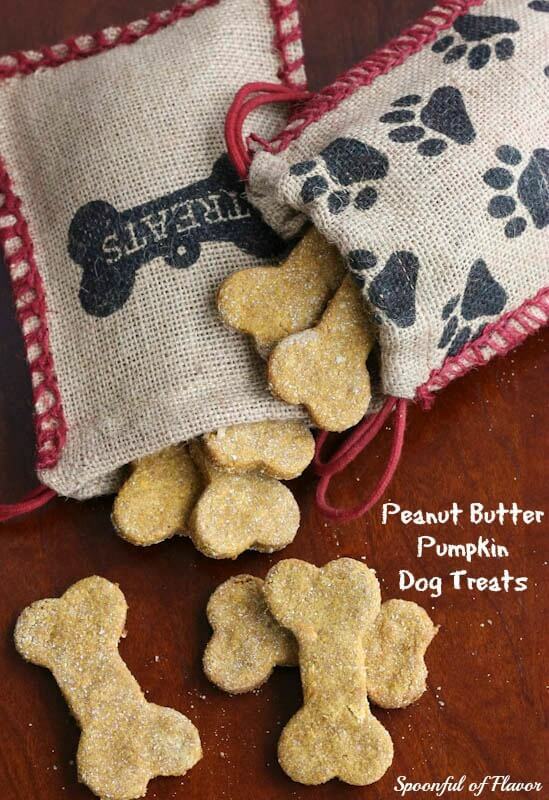 Peanut Butter Pumpkin Dog Treats are one of the most popular recipes on this site because they are made with natural ingredients that you probably already have in your fridge and pantry. They come together in little time and are the perfect homemade gift. I use this large dog bone cookie cutter. 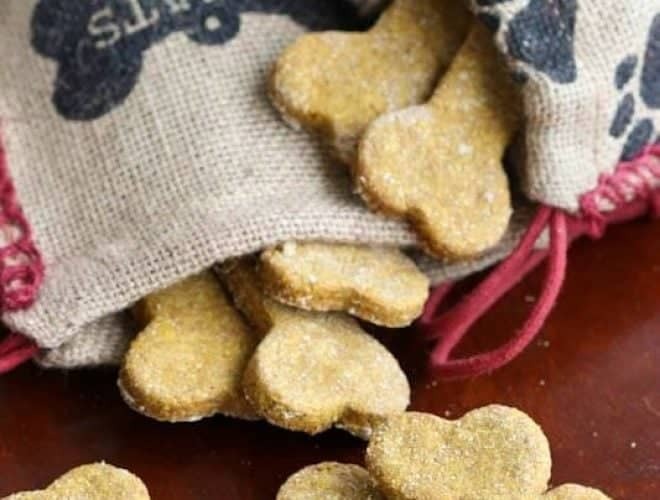 Go ahead, bake your pup something they will love! In a large bowl, whisk together the eggs, pumpkin and peanut butter until combined. Add oats and flour and stir well until dough forms. The dough may be a little sticky, so dust your hands and rolling pin with flour. Pour dough onto a floured surface and roll out to 1/2 thick. Cut out using cookie cutter. Bake for 30 to 35 minutes until golden brown. 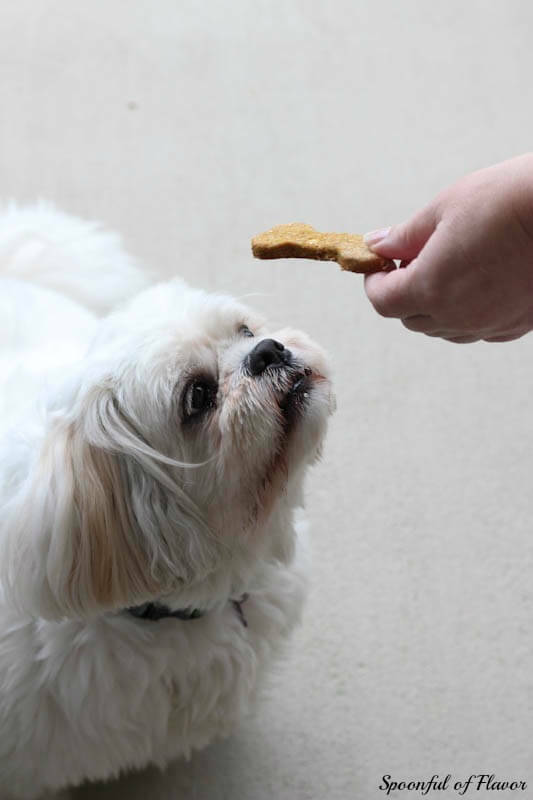 If your dog is on a grain free diet, substitute the oats with an extra 1/4 cup grain free flour. I have been using your recipe for over a year now and LOVE IT! 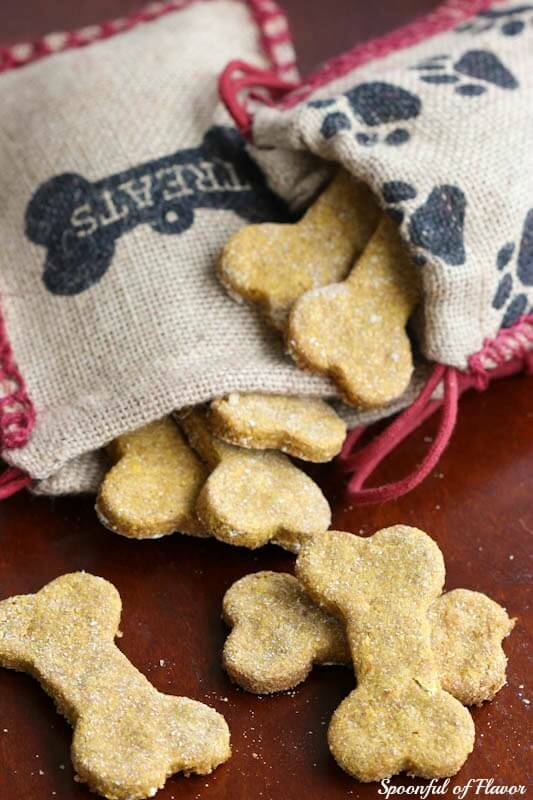 I make them for my four legged grand dog and these are the only treats she gets. I’ve quit counting after 50 dozen made for her and others. Can you use all purpose flour? I don’t want to have to got to the store. Hi, Mary! While you can use all purpose flour, I recommend using whole wheat flour because it is better for dogs. hi! I found this post on Pinterest. I just made them for my dog. They were easy to do and he LOVES them! I'm going to make more to send to my Mom's dog for a Christmas treat. Thanks so much for sharing (2 years ago! lol). Hi Nicky! 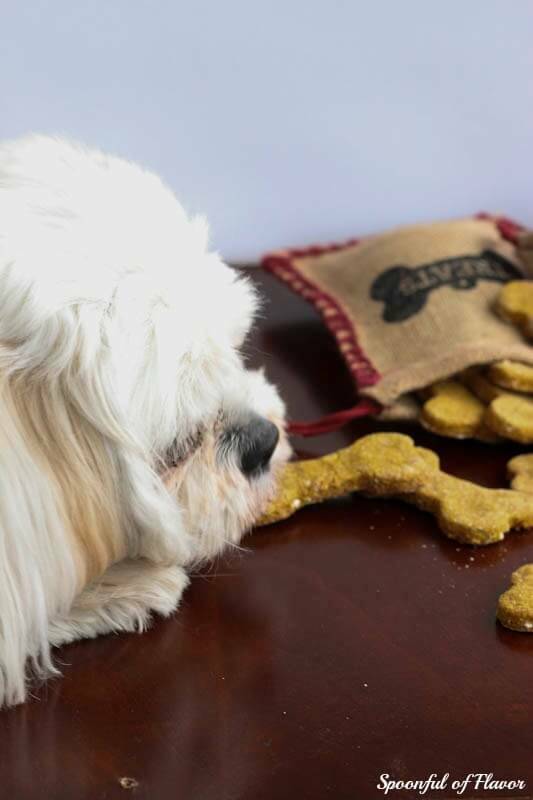 I am so glad to hear that your dog loved these dog treats. Have a great holiday season! HI, Pamela! You can store them in the refrigerator and they should last up to 4-6 weeks or even store them in your freezer and they will last longer. I made these today and my dogs loved them. They waited by the oven while they were cooking because I told them they were treats. I made them in mini muffin pans and they turned out to be the perfect size for my small dogs. Thanks for the recipe! Hi, Sunny! I am so glad to hear that your dogs loved them. Thanks for stopping by! Do these need to be kept refridgerated? Hi, Crystal! They will last longer if you refrigerate them, but they can be stored in an air tight container for up to a week or two on the counter. This recipe is currently in my oven. I make dog treats weekly. Can't wait for Titan and his friends to try these! Hi, Leanne! While you can use all purpose flour, I recommend using whole wheat flour because it is better for dogs. My walrus puppy loves these, we call them Grama cookies as my mom made these for our pup for Christmas. The only issue we ran into is they started to get mold on them. How do you store them so they don't get moldy? This is after about 2 weeks of having the cookies. We keep them in an old plastic treat container. Hi, Shannon! I am glad to hear that your pup loves them. You can store them in the refrigerator and they should last up to 4-6 weeks or even store them in your freezer and they will last longer. 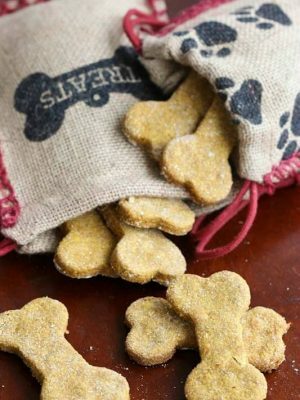 I just made these for my dogs! How did you get them to look so perfect? Mine puffed up in the middle. Hi, Nikki! I don't have any special secret. I used a fairly large cookie cutter. They will puff up a little. I hope that your dogs enjoyed them! They loved them! Thanks for sharing! How do you suggest making them grain free? I saw the note on the bottom to replace the oats with 1/4 cup grain free flour. Would i still use 3 cups grain free flour instead of regular and add the additional 1/4 cup?! Hi, Janina! Yes, omit the oats and use 3 1/4 cup of grain free flour. Aer the oats regular or quick? Or does it matter? How could I make the chewier/softer? I have a picky boxer and he only likes soft treats.Thank you. Love it! Please please share where you found those burlap bags! They are adorable!!! Hi, Linda! The bags were actually a random find at Marshalls during the holiday season. Thanks Ashley! I LOVE Marshall's! 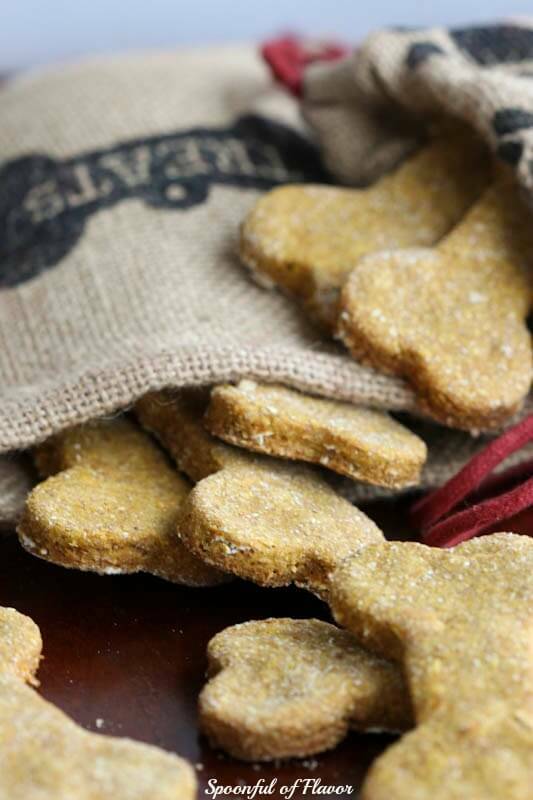 Were they only at Christmas?My daughter-in-law is a baker and is a vendor this weekend at a huge Pumpkin festival, and she has made dog biscuits (although I sent her this recipe because of the "grain free" option. )These little bags would be so adorable to have them in!! Yes, I have only seen them at Christmas time. In a few short weeks they should have them or something similar. You could also try looking online for burlap treat bags.